Tattio is a fabrication process that draws from current body-decoration processes (e.g., jewelry-like metallic temporary tattoos) for the creation of on-skin technology. 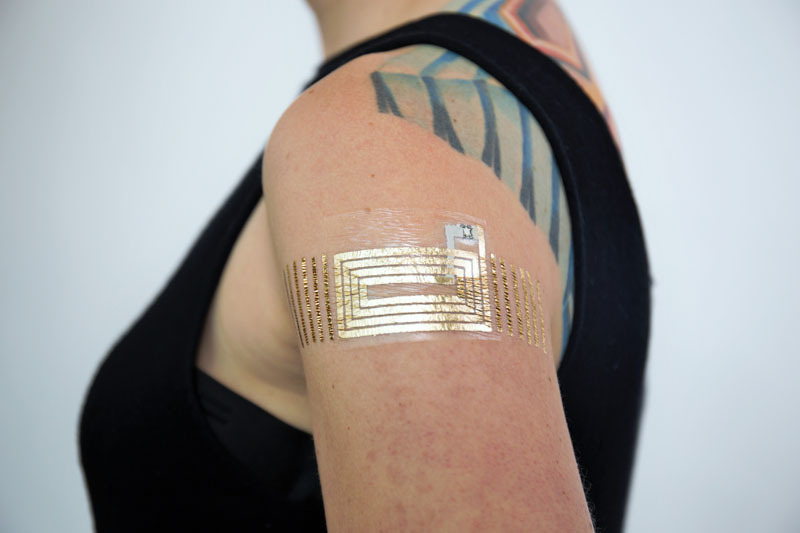 The fabrication process generates functional components such as NFC tags, circuitry, and thermochromic tattoos, while maintaining the aesthetics and user experience of existing metallic temporary tattoos. The fabrication process is low cost, accessible, and customizable; we seek to enable individuals to design, make, and wear their own skin-technology creations. Kao, H.-L. C., Johns, P., Roseway, A., and Czerwinski, M., Tattio: Fabrication of aesthetic and functional temporary tattoos. Proc. of the 2016 CHI Conference Extended Abstracts on Human Factors in Computing Systems. ACM, New York, 2016, 3699–3702. Tattio allows users to create their own on-skin technology designs.